I just spent the last five minutes looking at Rihanna’s Instagram feed. I just… I dunno. It’s been that kind of week. I don’t know about you, but I like to maintain a certain level of life pace. One social event a day? Cool. Three social events a day? I start looking for my hermit box. One bad phone call a week? I’ll take it; that’s real life. Three bad phone calls in a week? Hand me an ice cream sandwich or five, please. As you can guess, this last week was not so kind to my preferred life pace. It hasn’t been all bad, though. I mean, The Bachelorette started last week (and I get to hang out with the Bluths again), so that’s fun. It’s summer, so there’s that. Oh, and I made stuffed cheesy bread. So… yeah. Not so bad after all. As long as we agree to forget about the Rihanna thing. In the interest of moving on, let’s talk about cheese and bread: Two of my favorite things. 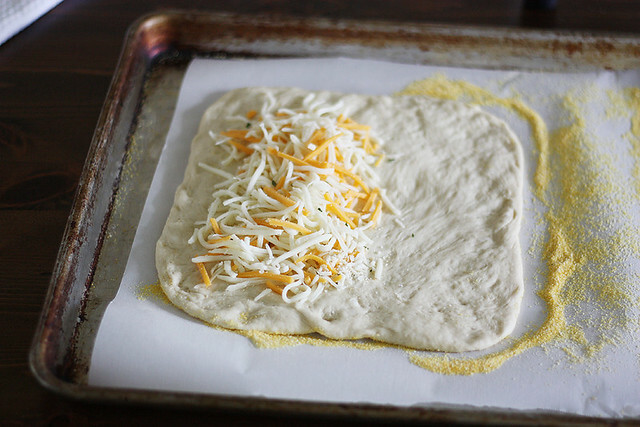 What you’ve got here is a typical yeast dough-like situation, which turns into a cheese-topped dough situation, which turns into a cheese-STUFFED dough situation, which turns into breadsticks and then, magic. In so many words, anyway. Be forewarned: This recipe makes two loaves of breadsticks which, at the time, might seem like plenty. But once you get even a remote whiff of the gooey, melty, cheesy deliciousness going on in the oven, you just might start looking at them like they’re actually really small. Like, totally one serving per loaf small. And then you’ll say to yourself, “But I just ate lunch,” but then you’ll decide that your lunch was actually not all that great and kind of needs a do-over, and oh look, fresh-baked stuffed cheesy bread just came out of the oven and you can’t just let that go to waste, now can you? And thus, second lunch is born. In other news, can someone suggest to me another hobby besides looking at celebrity Instagram feeds? Kthanksbye. In a small bowl, stir together the sugar and water. Sprinkle top with yeast and let stand until foamy, about 10 minutes. Stir in vegetable oil. In a large bowl, whisk together flour and salt. Make a well in the center and add yeast mixture; stir to combine. Using dough hook, knead dough on medium speed until smooth and elastic, about 3 minutes (OR, knead by hand on a lightly floured surface until smooth and elastic, about 5 minutes). 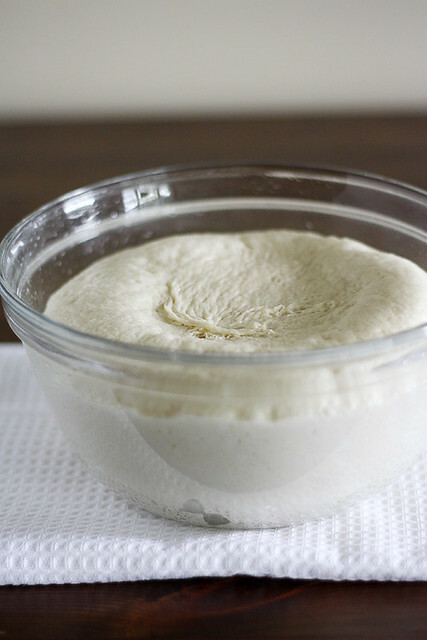 Shape dough into a ball and transfer to a lightly greased bowl; turn to coat. Cover bowl with plastic wrap and let rise in a warm place until doubled, about 1 hour to 1 hour, 30 minutes. When dough is risen, heat oven to 450 degrees F. Place an inverted baking sheet on the middle rack. Line a second baking sheet with parchment paper; sprinkle with cornmeal. In a medium bowl, toss together cheeses, garlic powder, salt and parsley flakes. Divide dough in half; press each piece on the cornmeal-covered parchment paper into an 8-inch square. Top one side of each square with 1/2 cup (for each) of the cheese mixture. Fold over and press edges lightly to seal. Use a sharp knife to slice dough into 8 1-inch strips, stopping just before the folded edge. Sprinkle evenly with remaining cheese mixture. Carefully slide dough on parchment paper on top of inverted baking sheet in oven. Bake until golden brown and bubbling, about 12 to 15 minutes. Let cool slightly before pulling apart into breadsticks. I’m pretty sure cheesy bread makes everything better! ummmmm YES YES YES to this. Looks amazing!!! Don’t feel bad about RiRi’s Insta feed. I did the same thing with Amanda Bynes’s Twitter, except that was for like 20 minutes. YIKES. I’ll leave it at that. Love, love , love! I mean cheesy bread! YES! 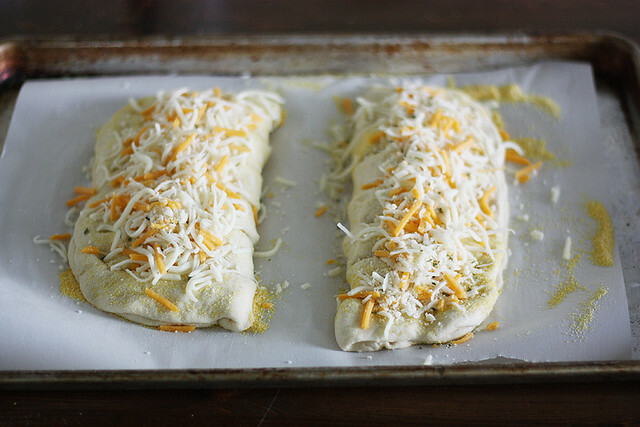 STUFFED cheesy bread? Um, yes please! Steph — You know it! 🙂 Thanks, dear! This is heavenly!! Lovely recipe! uaghhh I had such a busy weekend, I could use some stuffed cheesey bread. This sounds SO epic. Katrina — Thank you, love! Kelly — I wish we could hang out together and recoup from this weekend with some cheesy bread and a glass (or two) of wine. 🙂 Hope things are looking up for you this week, though! 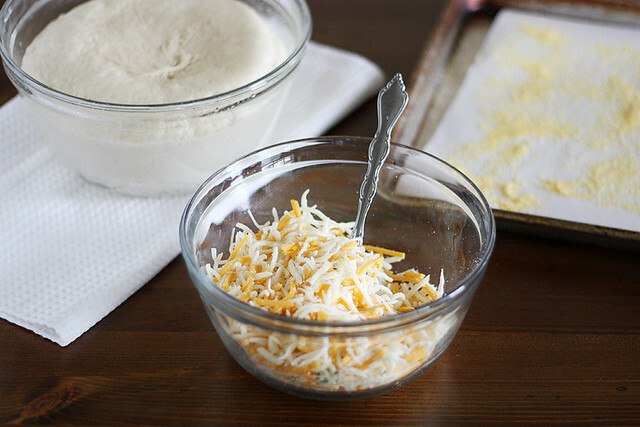 I really must start baking bread because who doesn’t want homemade bread loaded with all kinds of cheese. Looks so good, Stephanie! Not only am I going bonkers over your cheese-stuffed bread, but I’d make the batch just so I could say I had two loaves of breadstick baking in the oven. CRAZY good! Google images of our favorite Voice coach? That wasn’t helpful at all. I think I need some stuffed cheesy bread to ponder this over. This looks like the type of recipe that could make me face my fear of yeasted dough… looks so immensely good! One of my biggest weaknesses…. Yum! 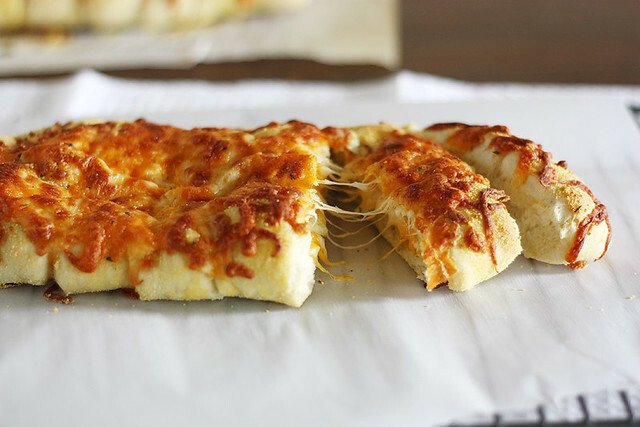 Love cheesy bread! Belinda — Ha! Great minds. 😉 Yay for cheese lovahs! Daisy — Get on it, girl! 😉 But seriously, it’s definitely worth making. Thanks, dear! Lisa — Tell me about it. It went WAY too fast in our house. 🙂 Thanks, dear! Okay, now I want to scroll through Rhi’s Instagram feed while I eat a bunch of pieces of cheesy bread! Oh, oh yes. This needs to be in my kitchen. Looks sooo good!!! Wish I had some now!!! 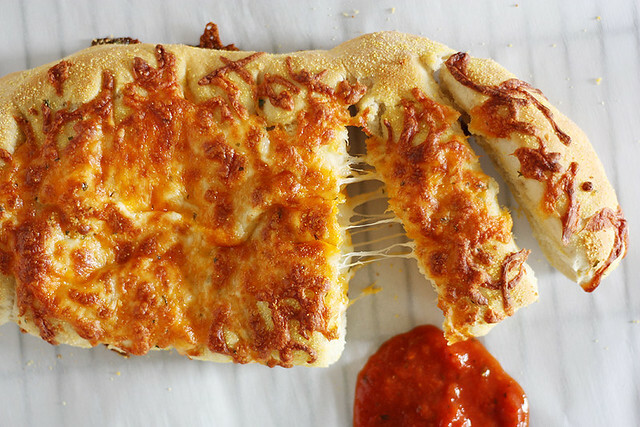 Cheesy bread yes, yes and yes! Bread? Cheese? Wow! Thank you, thank you, thank you. Hayley — It does. It definitely does. 🙂 Thanks, doll! Meagan — I agree! 🙂 Thanks! Laurie — I’m right there with you. 🙂 Thanks, love! Woah! Stephanie, this bread looks amazing! I love the cheese on top AND inside! Yummers!! That last photo is actually kill.ing.me. These look incredible, Stephanie! Oh yes! Just what I need in my life! I seriously need this bread! Oh. My. Word! This looks so amazing! I hope the cheesy bread made things a little better! How could it not?! And no judgement on the Rihanna instagram feed. I’m sure I’ve done worse! Unless you’re looking at Justin Bieber’s feed. Then we have bigger problems! Jocelyn — Thank you, dear! Julie — Thank you, friend! Oh man, I’ve had weeks like those! Although I’ve never had cheesy bread like this to make it all better. That needs to change!!! oh my gosh…this looks crazy good…and yeah that it makes 2 loaves because we always NEED an extra loaf of cheesy bread! Angela — True story! 🙂 Thank you! My mouth is legitimately watering. I need to make this soon. That last picture…with the stringy cheese…omg. I need a hermit box after a super social week, too. Rihanna stalking moments? totally a thing in my life. I’ve been trying to decrease them since I’ve been using the.boy’s laptop and don’t want him to go through the search history and realize what a psycho I am..but still. It’s a thing. Cheesy bread = cure for all things. Good or bad. Step away from the celebri-tweets on the Instagrams. More often than not, those just make me more ragey and I need to console myself with carbs or a new nail polish. Or more carbs. Just covering my bases here. GIMMER THESE! Megan — Haha, yes to more carbs and nail polish! I’m so with you on that 🙂 Thanks, friend! 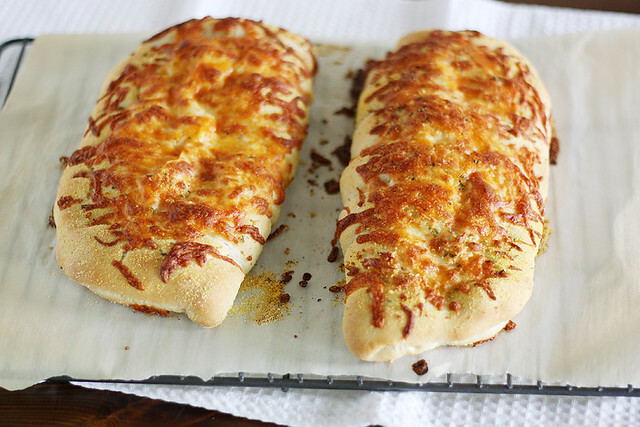 Cheesy bread sounds like heaven! I think I am gonna have to double this recipe because two loaves of breadsticks do not look like enough. Oh WOW, look at all that cheese-y goodness. Looks delicious and I just want to sink my teeth into it. 🙂 Lovely post. yep… making this tomorrow… or now… the focaccia bread I have rising might have to turn into this. thanks for posting! Amy — Oooh, I think that’s an excellent idea. 🙂 Thanks! Hugs – hope you have better upcoming week. This bread sounds amazing, bread and cheese are 2 food groups I can get behind and love dearly. Pinning to make – thanks! This bread looks incredible!!! And I have some leftover marinara sauce. Definitely making this bread today!! Wendy — Oooh, let me know if that grill option works out well for you; sounds delicious! Thanks! Oh my goodness this was so delicious and easy peasy! I have already made it twice. The second time I used fresh minced garlic and it was delightful! oh gosh, i came across this recipe and i am pretty psyched about it! Cheese in and out! This looks so good. I need a dough to make my spaghetti bake, and this looks great. I don’t have access to cornmeal though, since I’m in the uk. They don’t seem to have it. Is there a substitute? Sarah — You could just use more all-purpose flour — the purpose of the cornmeal is just so that the dough doesn’t stick to the pan. Hope you like it! Would using all purp flour instead of unbleached be ok? would it change anything? Jay — Unbleached is all-purpose flour, just, well, not bleached. 🙂 So yes, any all-purpose flour works great! The only trouble I had was being able to cut the dough into breadsticks BEFORE baking it… the dough was too sticky and my knife kept getting stuck, so I just cut the bread after I baked it. Not a problem though, I probably should have put more flour or kneaded it better. But thank you for this recipe, definitely making it again! Love this recipe. 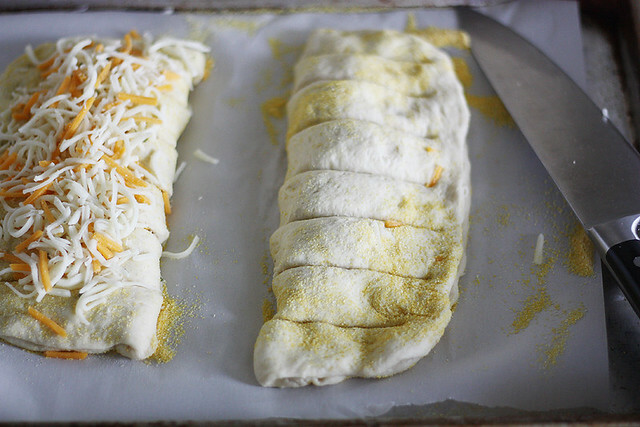 My friends always request this cheesy bread when we are having a party or get together.